Fluval's Roma designer aquarium range offers something for every type of Fishkeeper with its contemporary design and clean, simple lines. The full range of Roma aquariums are equipped with energy efficient LED lighting, with a bright daylight spectrum to help support plant growth and enhance fish colours to truly transform your aquarium. Roma comes complete with the essential equipment needed to set up your aquarium including a Fluval internal filter and heater. The space-saving design of the cabinet provides ample storage to hide away any other accessories including an internal shelf with enough space to hold a canister filter. 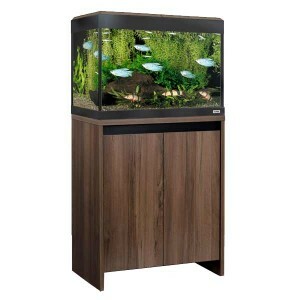 Roma cabinets also feature soft close doors to help reduce stress to your fish. Once we have processed your order, this product will be despatched on a pallet delivery service for customers within mainland UK (As specified by our couriers). This service is free of charge for this item. All pallets are kerbside delivery only. All pallet deliveries need to be booked in by our courier, customers will receive a confirmation call to arrange this. Pallet deliveries are normally delivered within 48-72 hours after dispatch Monday - Friday. No pallet deliveries will be attempted until our courier has booked in a delivery date with the customer. We cannot accept claims for damages once you have inspected and signed for your goods. It is therefore essential that you are satisfied that your goods are in good condition at the time you take delivery.